After completing several DIY painted furniture projects, I’m kind of liking my Annie Sloan Chalk Paint. As Ms. Sloan promised during her visit to the east coast this spring, her low VOC paint does adhere to anything, and requires no primer or special prep. I like that. Also, it is quick drying and presents a “matte velvety” finish. 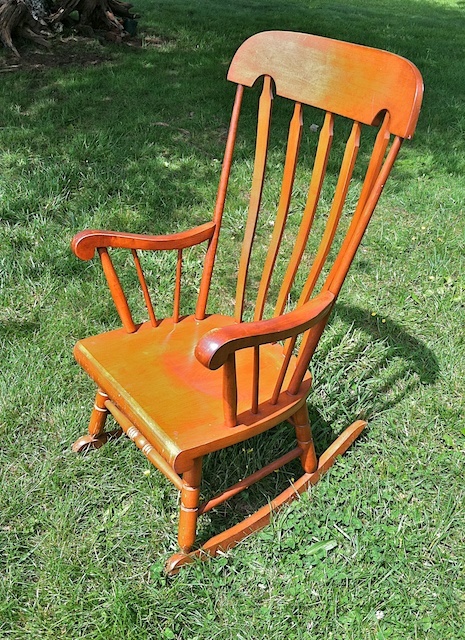 Perfect for decorative painting projects, especially worn or old furniture that could use a facelift. So far, my eight ASCP colors – out of 29 offered by Sloan today – are each quite conservative and light in tone. They are: Old White; Cream; Versailles; French Linen; Country Grey; Old Violet; Duck Egg and Louis Blue. I need some more colors in my palette… more intense colors with punch! These are code words, off course, for: buy more paint! The only problem is, when I try to decide which two or three colors will come home next… immediately, my list grows to no less than eight different hues. Hummm. At close to $40 per quart, I’ll be giving some serious thought to my choices. 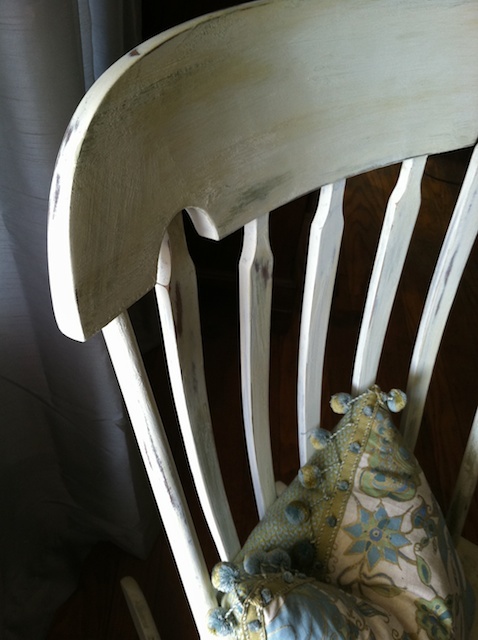 For the rocker, I used Old White, then layered and textured a bit with Cream and Versailles. Also, I sanded in places throughout the process to let the original wood show through. So far, I’ve not finished this piece with my final layer of wax, however, I plan to top it with Annie Sloan Soft Wax in Clear. All in all, the project took several hours… a solid half to three-quarters of a day, considering drying time between coats. I was going for a sort of worn, shabby chic, textured look that was light (but not white) and would work in a variety of decorating styles. I spend so much time these days striving to get things exactly right, carefully writing, designing, working and reworking things over and over, not wanting to make a mistake, that I’ve forgotten how to just have fun, and not worry about consequences. 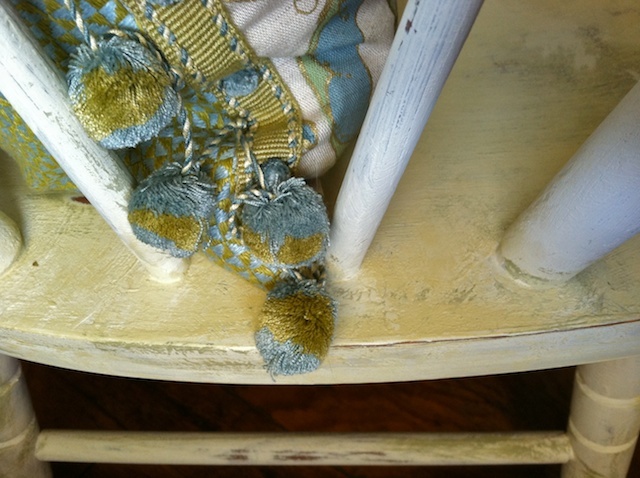 Annie Sloan gave me permission to work quickly, to be messy, and best of all, to make mistakes. 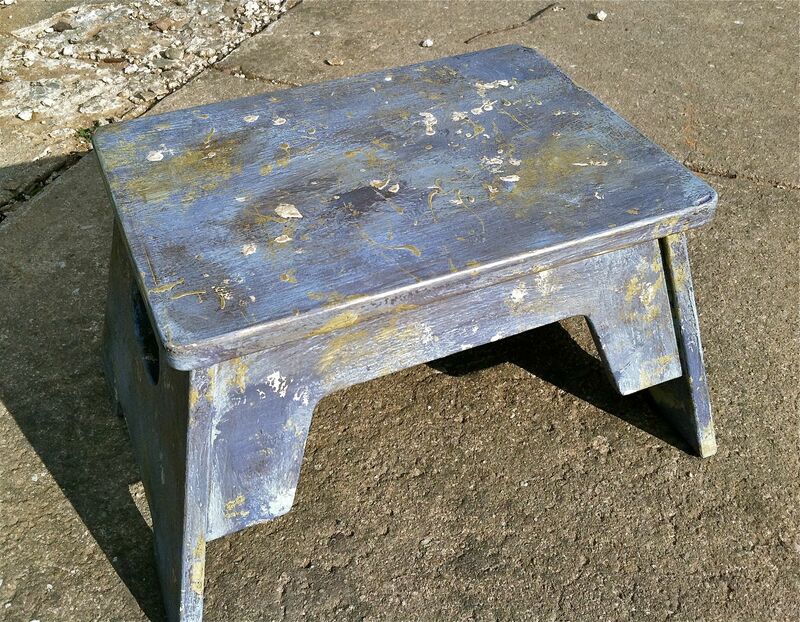 I’ve got a basement chock-full of old, unloved furniture, and I decided to experiment with a few pieces. 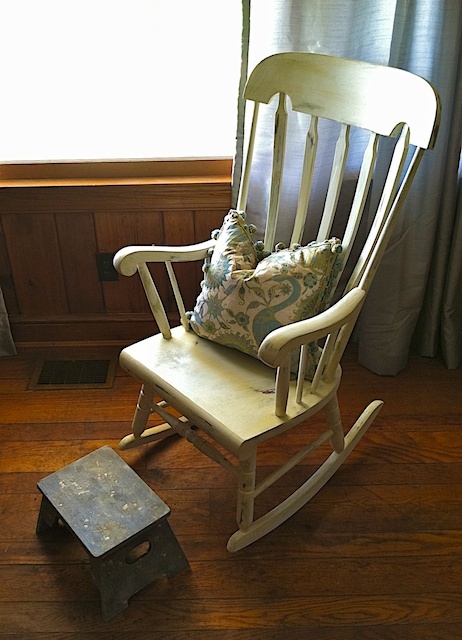 After the Annie Sloan workshop, I stopped off at Janet Metzger’s The Empty Nest at The Fox Den Antiques Mall in Warrenton, Virginia, to purchase a few cans of Annie Sloan Chalk Paint. The “experimental” paint colors that I chose were mostly lighter tones in blue, green and creamy neutral hues. Also, I purchased a can of Annie Sloan clear wax and a can of dark wax, and I picked-up some uber cheap paint brushes at Lowes (the short-handled kind of brushes that come several to a package… I mean really cheap!). 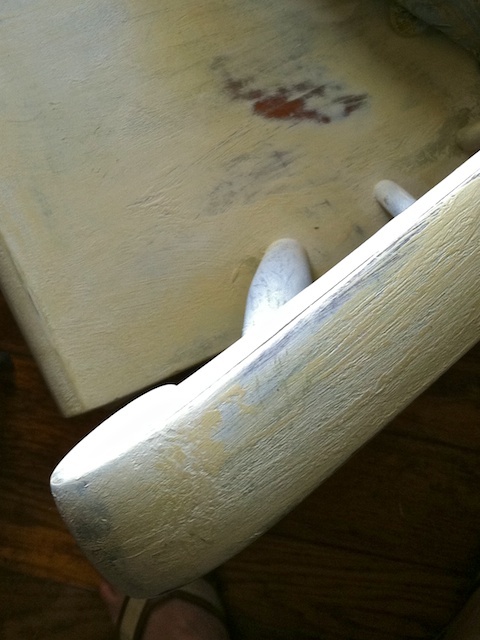 My first paint victim was an inexpensive, little white stool that I’d purchased at Target several years ago for my husband’s grandchildren to use. 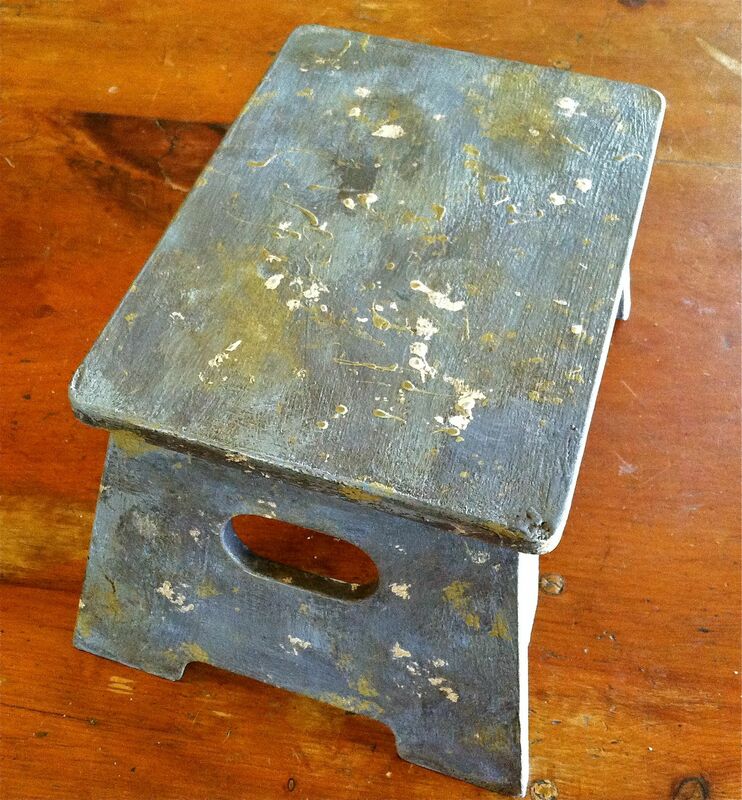 The stool’s surface was very slick, and and after years of use, it looked quite shabby (not in a good way). It was going to be interesting to see how successful I could be trying to transform a slick, monochromed, modernesque surface into something I hoped would appear multi-colored and textured, as well as old and worn (in a good way). When I was finished with the first layer of color, the paint easily rinsed out of the cheapo brush in water (as well as my hands!). After the Old Violet dried, just a few minutes later, using the same brush, I applied random strokes – some quite thick and “blobby” – of a light blue called Louis Blue. Then, before the Louis Blue dried, again with the same brush (not so carefully rinsed this time), I added a light yellowish green called Versailles. And again, I made my strokes random, in all sorts of different directions using various amounts of pressure. I tried to apply heavy applications of paint in order to create ridges and valleys of texture over the originally smooth surface. 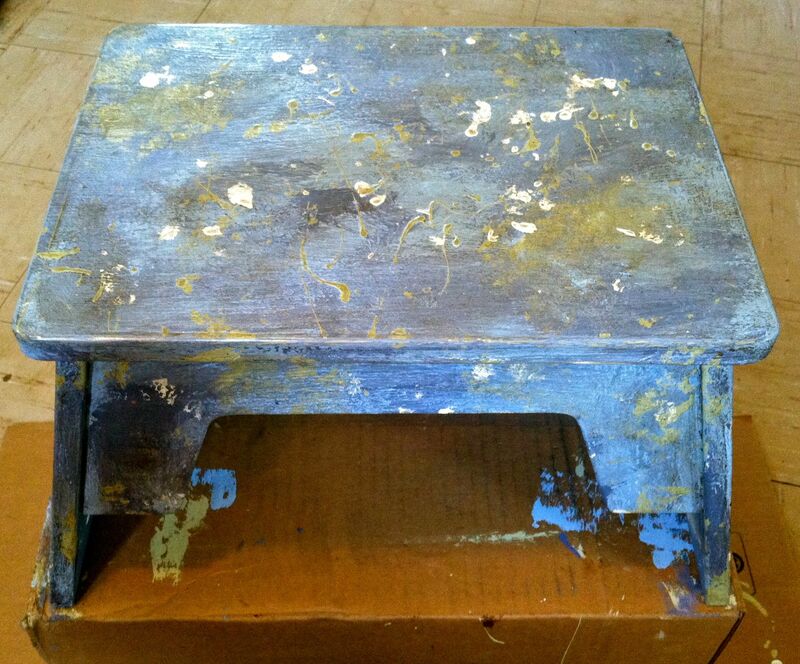 Also, I pushed the wet Loius Blue and Versailles colors together in a few random places on the stool. Moreover, I used a rag to wipe-up and smear paint in areas. There were no rules. I was making a mess on-purpose. Then, I reapplied some more of the Old Violet here and there. Next, with the same cheapo brush I spattered some of the Versailles over the surface (this would have been more successful with a decent brush). Finally, I added some Old White spatters. The entire process took less than an hour. 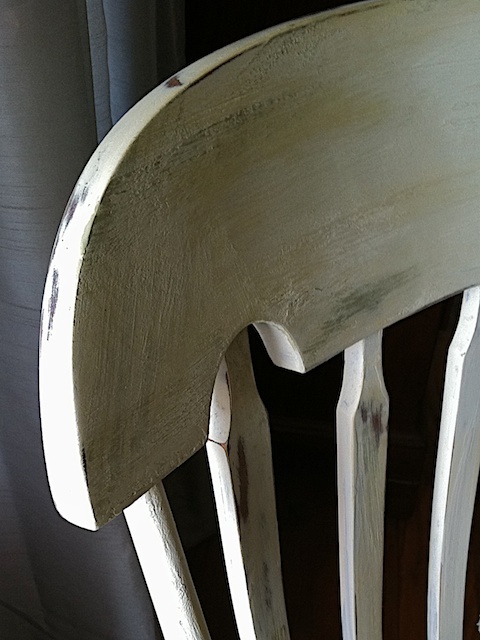 When the paint was dry enough to touch, I applied a coat of clear wax all over the stool and gave it a good rub. 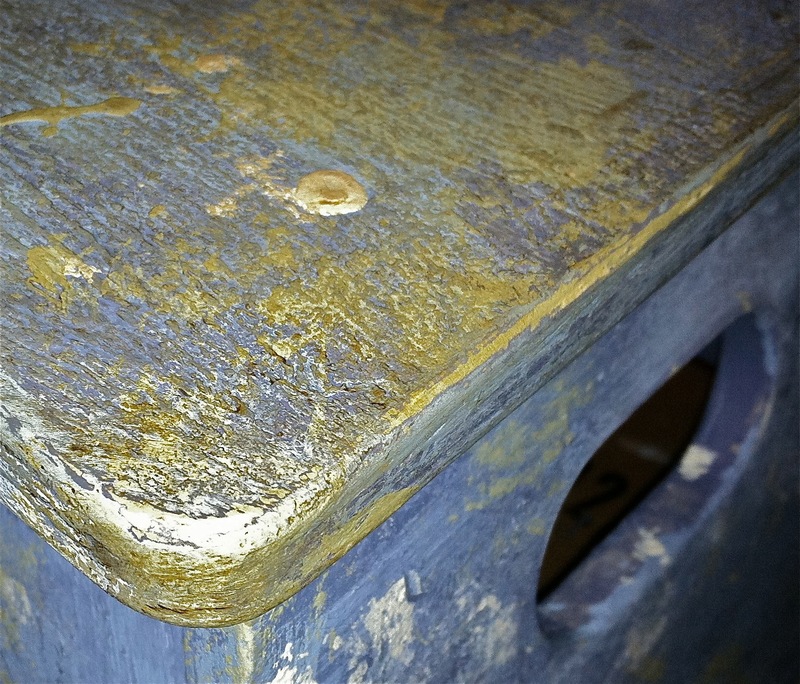 Next, I hand-sanded some areas, including some of the edges and corners of the stool to let under-layers of color show through, replicating “years” of wear and tear. Then, I applied a coat of dark wax, heavier in some places than others. 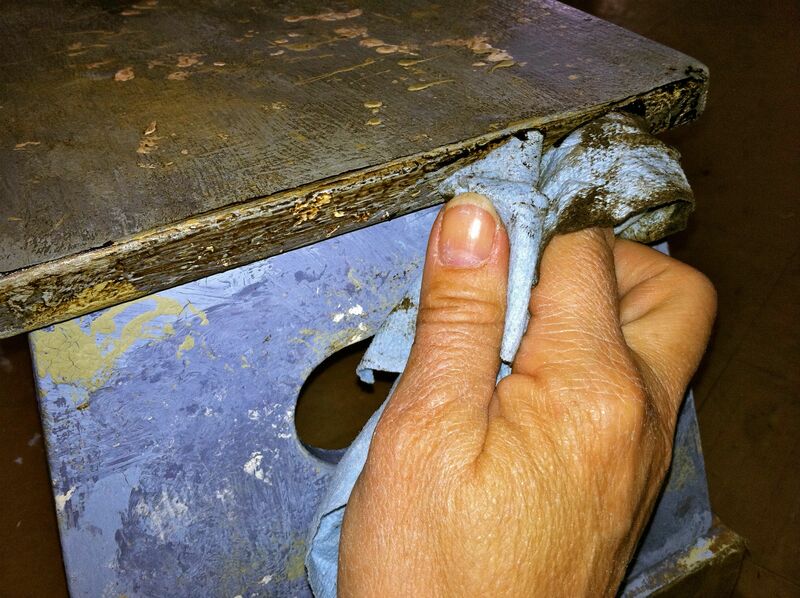 After a few minutes, I wiped-off the dark wax, using varied amounts of pressure around the stool. 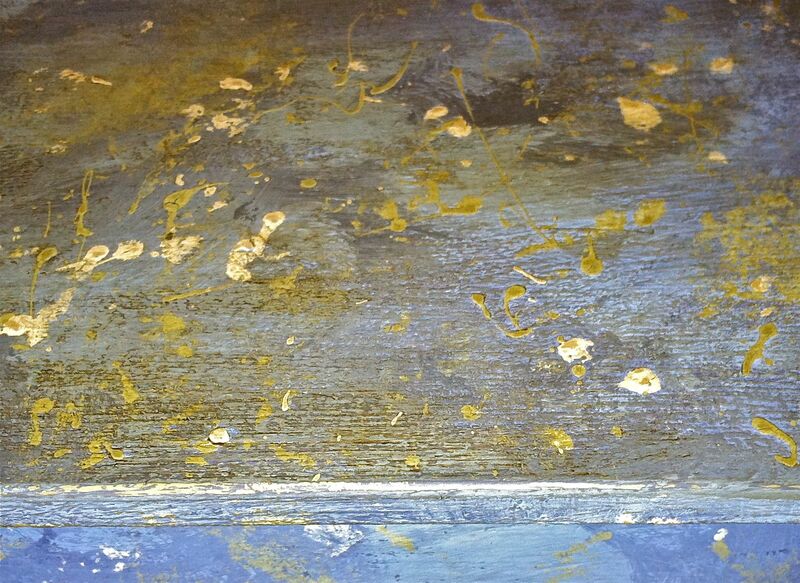 This toned all the colors and left dark low-lights in the nooks and crannies of the textured paint. About two days later, when the wax was fully dried, I buffed the stool by hand to give it a more polished finish… and viola! 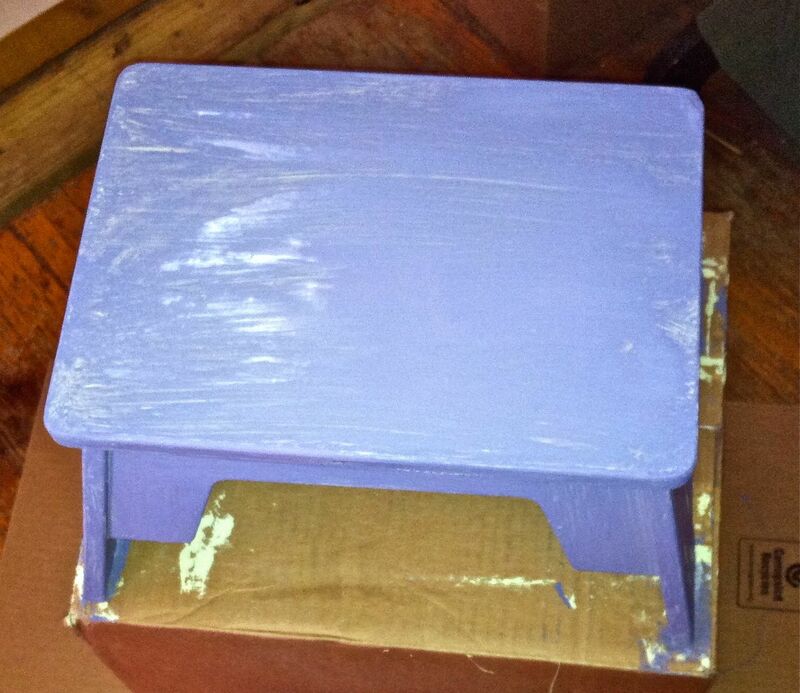 No longer ugly and abandoned in the kids’ room, my reinvented, repainted stool has proven to be quite versatile. The mix of toned-down colors blend in just about anywhere around the house and I don’t worry about getting it dirty. The rumpled “old” surface wears wonderfully well and the more it is used, the better it looks. Plus, it reminds me of my younger days, filled with oil paints and wonderful mishmashed palettes. Yes… I definitely need more colors. So, I plan to purchase some more Annie Sloan Chalk Paint; I’m thinking, a red, some darks and there are a couple of brights I’d like to play with as well. 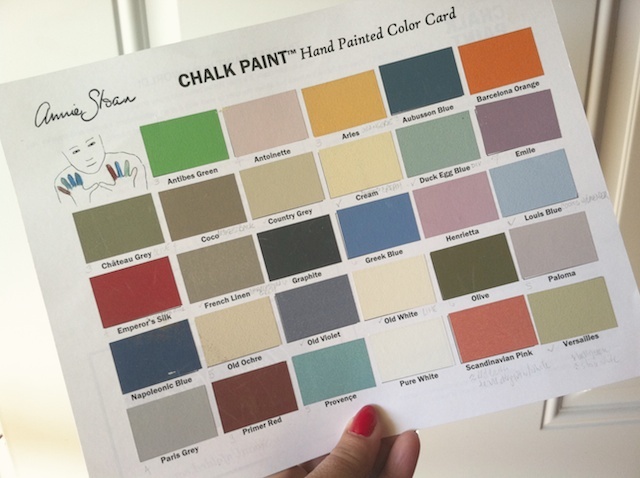 Of course, knowing me, eventually I’ll end-up with just about all of the Annie Sloan Chalk Paint colors (there are about 30 offered in her palette today).